"Unexpected Flying Animals" or "Winged Convergent Evolution"
Flying fish become airborne by leaping from the water and spreading their enormous pectoral fins. They typically fly from 100-200 feet, an adaptation that is thought to have evolved for predator-evasion. Check it out! Flying fish have to hold their breath (WTF)!! Moving from fish to reptiles, the flying snake climbs up trees (not unusual for snakes) and then jumps (unusual for snakes) from tree to tree. The snake flies (ok, glides) by distorting nearly its entire body into a concave wing-like shape and undulating through the air, in a process that is much more energy efficient and less prone to predation than slithering down to the ground and back up. 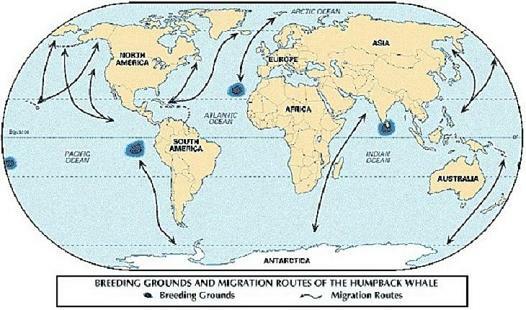 The humpback whale migrates up to 16,000 miles every year, from polar regions to tropical waters and back. The arctic tern migrates over 44,000 miles every year, from the arctic to antarctic and back. Bird migration routes. 1-Northern Wheatear, 2-Bluethroat, 3-Eastern Yellow Wagtail, 4-Dunlin, 5-Wandering Tattler, 6-Bartailed Godwit, 7-Arctic Tern, 8-Sandhill Crane, 9-Brant, 10-Smith's Longspur, 11-American Golden Plover, 12-Tundra Swan, 13-Semipalmated Sandpiper. 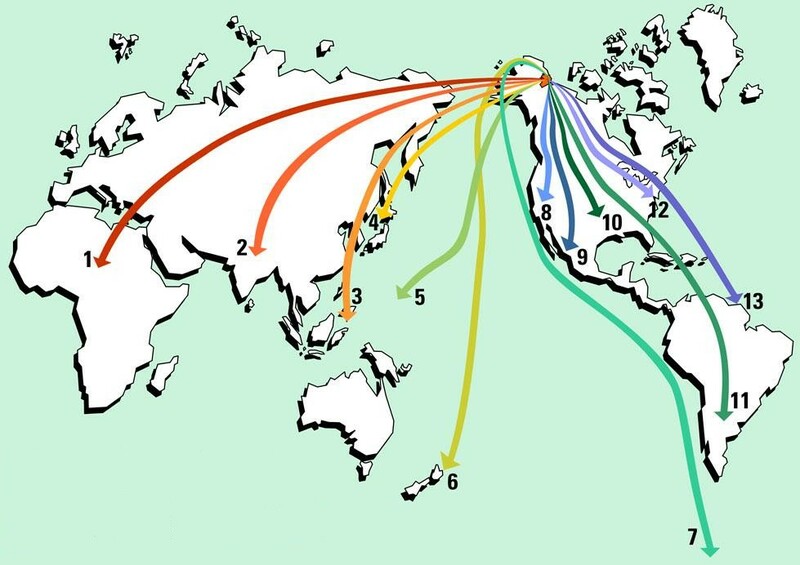 These are just two examples of the incredible migrations performed on earth every year. What could possibly motivate these animals to do this? Well, the exact reasons are slightly different for every migrating animal, but a unifying theme can be found in the video below. This is a video of "Net Primary Production", which is essentially a measure of the growth of plants. When you heat a can of beans on a campfire, you are transforming the chemical energy contained in the firewood into thermal energy (heat). As you are in your tent drifting off to sleep and the bean-induced-fart-chorus begins, you may ask yourself where the energy in that firewood came from. As with most energy sources, the answer is that it came from the sun! That firewood was once a tree that was merrily pursuing its life's purpose of fashioning itself a body out of carbon dioxide, water, and sunlight, in a process known as photosynthesis. Photosynthesis requires an energy source (sunlight), therefore the products of photosynthesis (wood, etc) can be thought to contain that photosynthesized energy. When you burn firewood, you are essentially running photosynthesis in reverse, releasing the energy from the sun that the tree went through so much trouble to absorb. So, fire is cool because it allows us to unleash energy from the sun in small amounts, whenever we please, regardless of when that energy first arrived on earth. In the case of firewood, that energy arrived anywhere from a few years to a few thousand years ago, depending on how long the tree had lived. 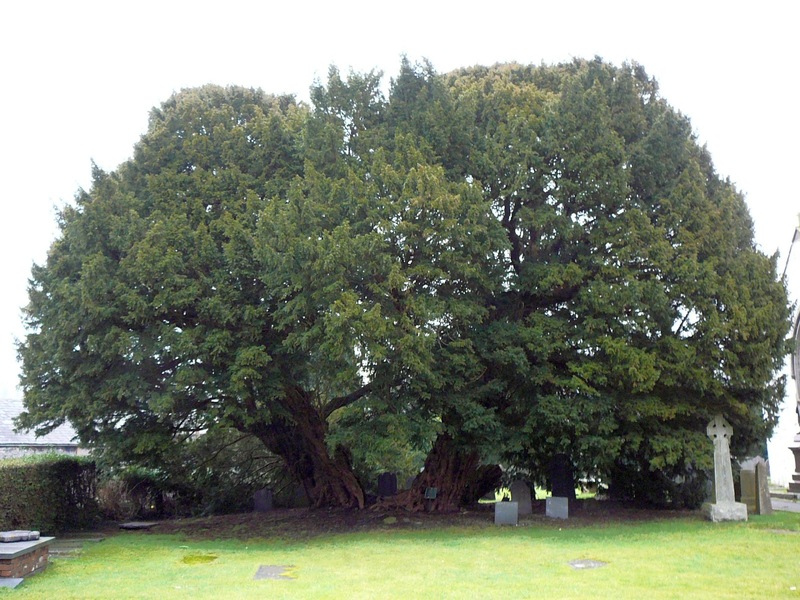 The Llangernyw Yew, a 4,000-5,000 year old tree. This same concept applies to anything else we burn, even fossil fuels, which is where things get crazy.